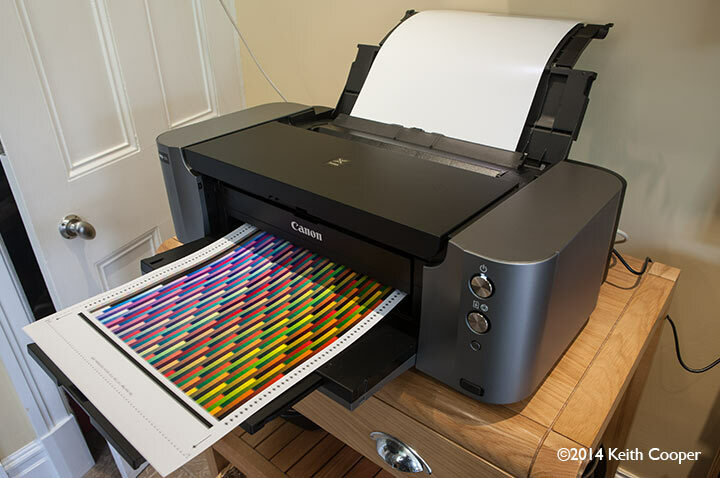 The PRO-100 is an A3+ printer from Canon, which uses a dye based inkset. 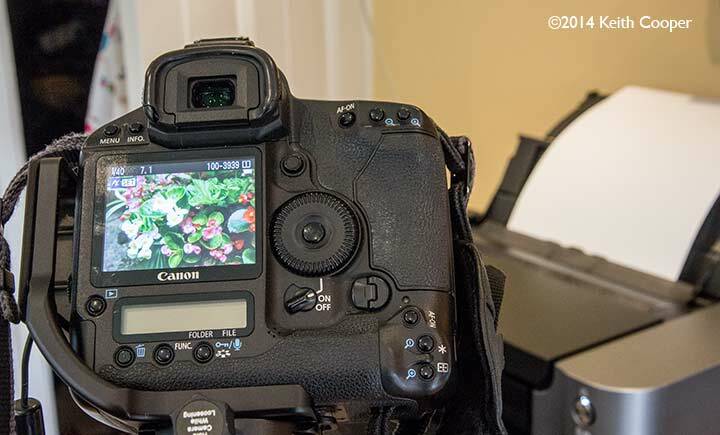 It succeeds the Canon Pixma Pro9000 Mark II. Keith has written lengthy reviews of the PRO-1 and PRO-10 models, so we decided to round out the collection with a review of the PRO-100. Most of this review looks at a Canon PRO-100 driven directly from Photoshop and using an Apple Mac. Functionality is very similar if you were using a Windows PC. 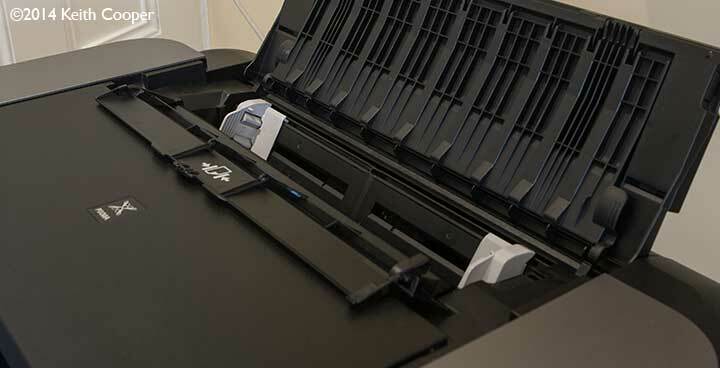 An 8 ink dye based printer which includes 3 grey inks for improved black and white printing. This review is unfortunately not as comprehensive as I’d like, since the printer developed a serious fault, not long into my testing. This reflects more the problems of shipping printers round for reviews than any reliability issues. Having spent a long time previously testing Canon’s other printers, I’m satisfied that I have enough information, particularly given the similarity (other than ink sets) between the PRO-100 and PRO-10. 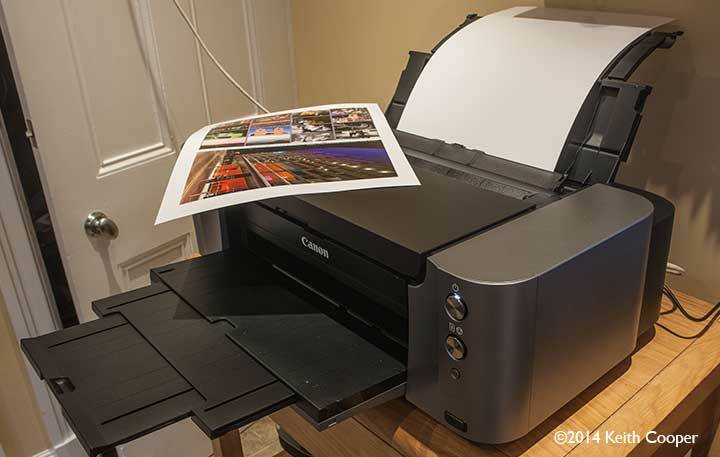 If you find areas of information not quite as in-depth as you’d like, I’d suggest also looking at the PRO-10 review, since my potential issues with the two printers (paper handling) are almost the same. Update Feb 2015. 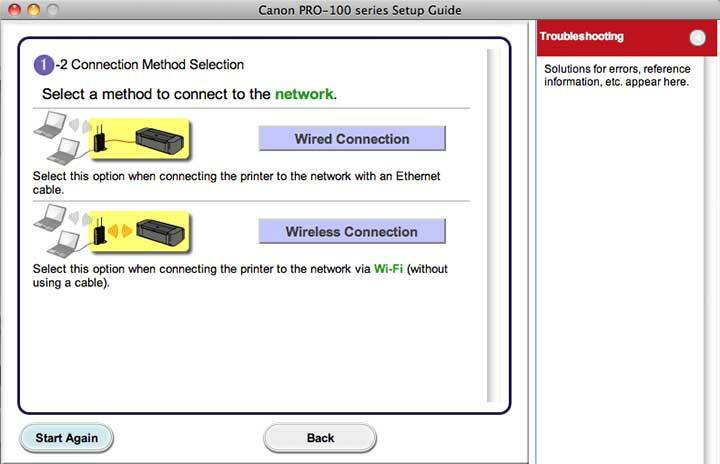 In Australia, Canon announce a PRO-100S model with improved connectivity, but no change to the actual printer. Looking at the specs, I’d say that my conclusions here are still valid. What do you get with the PRO-100? 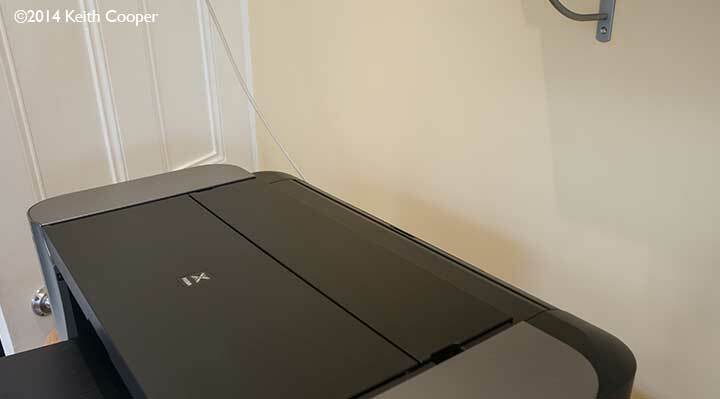 The exterior design of the printer is quite clean, with two main buttons, and no display or other indicators. Just three buttons, one of which is just used for wireless setup. 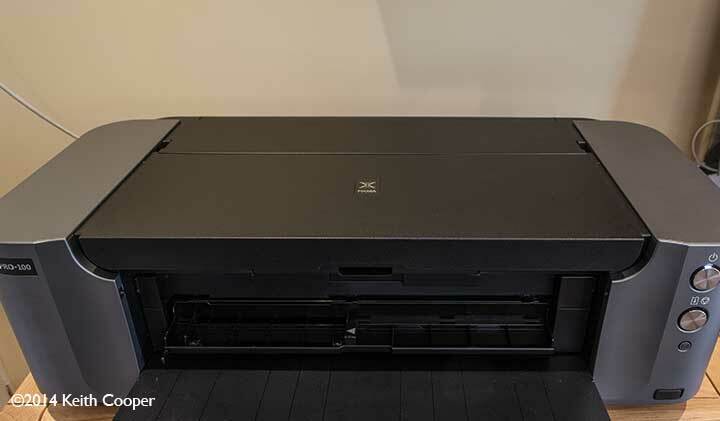 It’s a hefty printer with dimensions of 689 x 385 x 215mm (27.13 x 15.16 x 8.46 inches) and weighs a solid ~20kg, so you may want some help when getting it out of the box. Basically a six ink CcMmYK inkjet printer, but with two grey inks added. You do need to install the print head, but this is a relatively straightforward process, and is well documented. 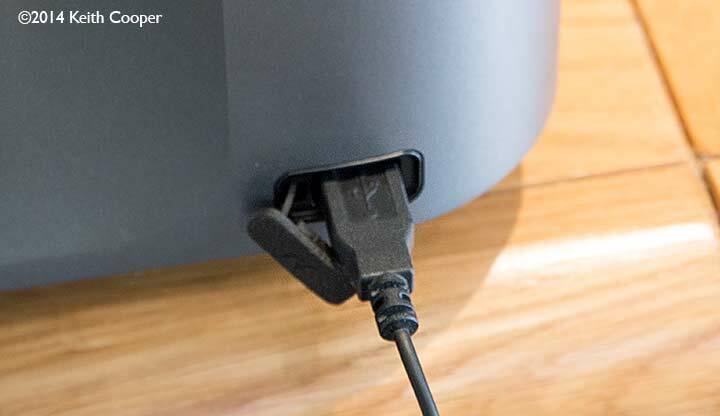 The printer incorporates wireless as well as USB and Ethernet wired connections. 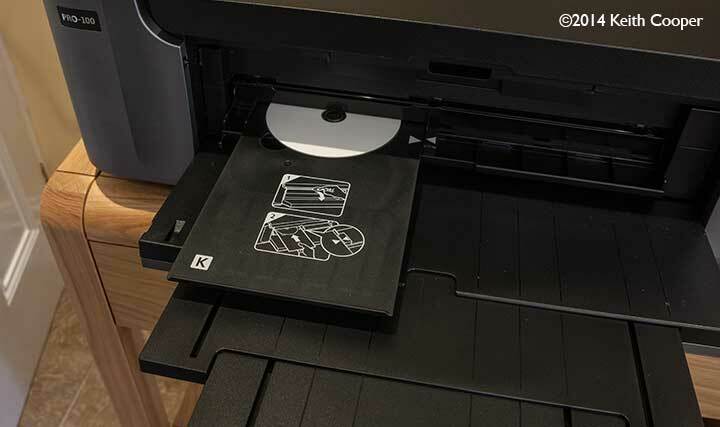 Networking is quickest to set up if you have a direct USB connection to the printer, but the main software installation process guides you through network and wireless options. Wireless connectivity is straightforward to initialise – the quick setup guide should suffice for most people, but there are more details in the comprehensive documentation (no hard copy though). The printer identified itself on our network, to the extent that I was able to print to it directly from our iPad with no initialisation or setup. The guide is easy to follow. 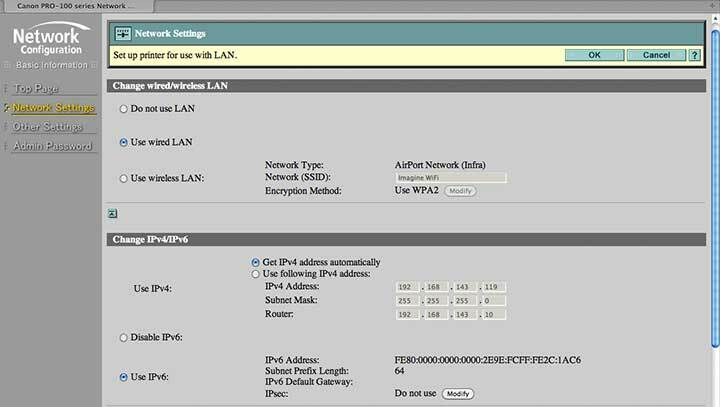 The printer has its own web server built in, where you can check a variety of settings, such as this network configuration. 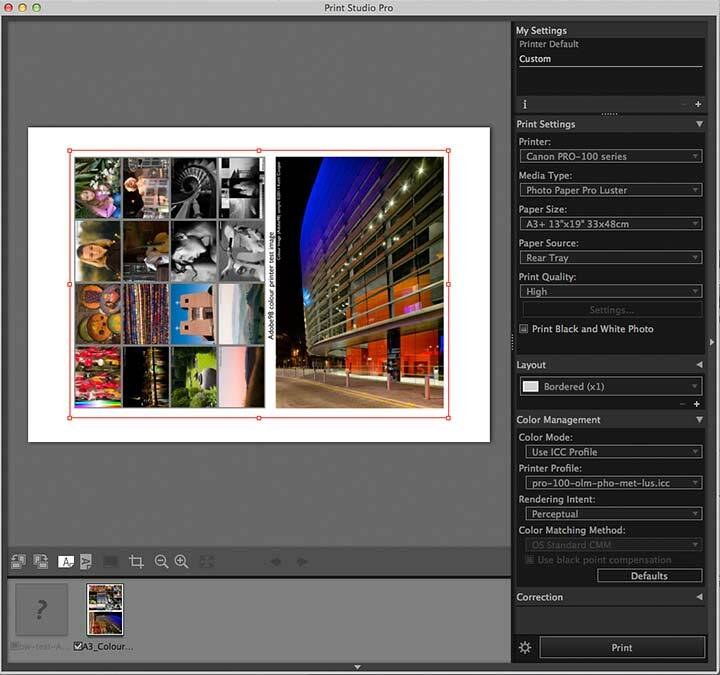 I printed images both via Canon’s Print Studio Pro and directly via Photoshop (CS6). PSP can work as a DPP plugin too. Both work perfectly well and handle colour management options clearly. I suspect that with good profiling you could produce bright vibrant prints on a range of art papers too, but remember that many are designed for pigment inks, so you may need to experiment a bit to find what works best with this particular printer. On a Mac there are some issues with printing ICC profiling targets, so I used Adobe’s special utility for this (see more in the colour management section below). 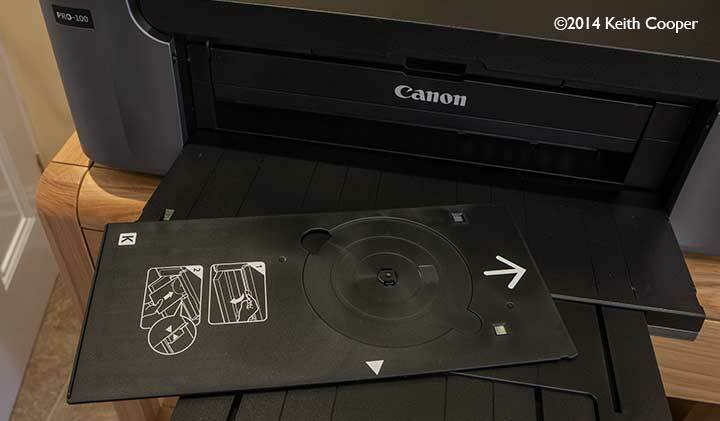 The printer lid lifts up for easy access to ink carts (move your mouse over the image to see). The red lights indicate that all carts have acceptable amounts of ink in them. A flashing light indicates a cart that may need replacing. Unfortunately, testing was cut short, so I can’t really give any more detail of the changing process, since the printer was shipped with carts fitted. Although incomplete, I could see changes in ink levels during my limited testing that showed that the ink level indicators have the same big steps in levels that you find in other Canon printers. 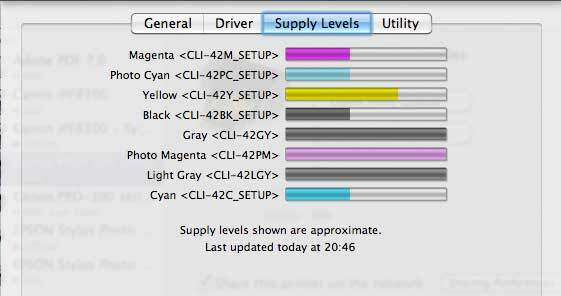 This means that the levels of several inks can appear to drop rapidly, when if the display was of fine resolution, it would only move a bit. 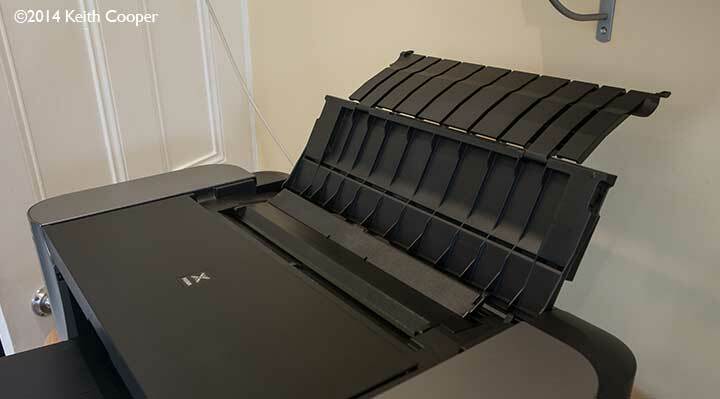 The printer has a top feed, which can take multiple sheets and a rear manual feed for single sheets, usually of heavier art papers. Quite a range of paper settings are available. 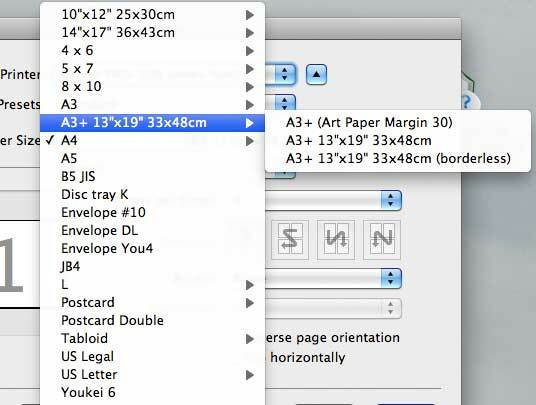 If you’re using large paper, such as A3+ (13″ x 19″) then do allow for quite a bit of space at the back and front of the printer. That brownish magenta tint – I’m afraid it’s what the B&W print mode looks like under halogen lighting. This isn’t the end of B&W printing – I’ll come back to it in a bit and show more of what can be done with a bit of care. 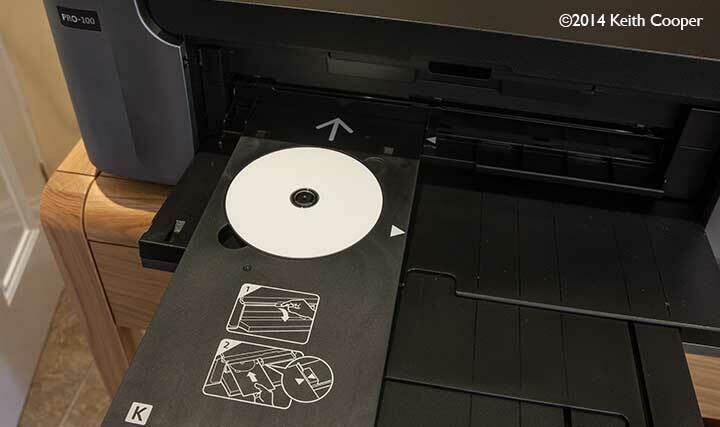 The printer comes with a special tray for holding CDs whilst being printed. 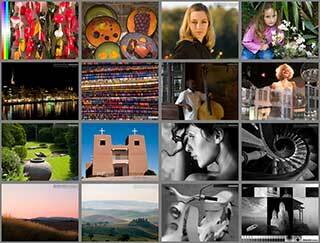 There is software supplied for creating your images. Fairly capable, but needing a bit of experimenting if you want to move beyond the supplied templates. 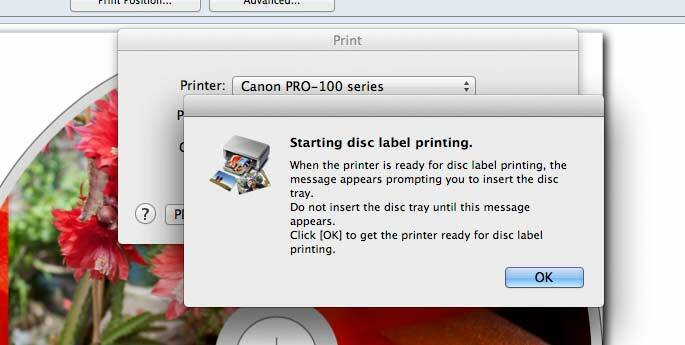 You don’t load the disk unit until it’s ready to print. The tray is slid in, until the alignment marks match (mouse over to see). 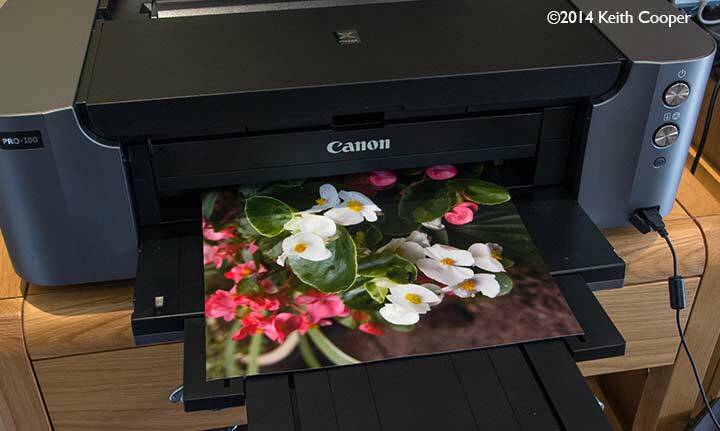 It’s possible to directly connect your camera to the printer via the USB socket at the front. 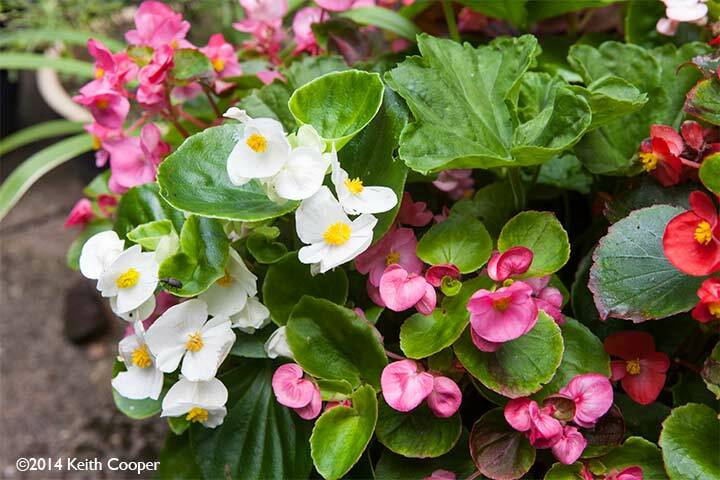 I nipped out into the garden and just snapped these brightly coloured plants. The camera is simply connected up with a USB lead. Controlled via the camera, I just loaded an A3 sheet of Canon’s PT-101 glossy paper. It took around 5 minutes to print. Note the perfect borderless printing – the Canon print mechanism can obviously work fine at the edge of paper, something that makes me wonder why Canon insists on setting huge top and bottom margins on certain paper types. Due to the faulty printer, I’ve not shown it here, but see my comments about paper size and margin limitations in my PRO-10 review. This colour corrected shot, shows how the resulting print looked under tungsten (Halogen) lighting. Not at all bad for no processing whatsoever. I’ve tried out numerous papers via the top loading slot, using Canon supplied profiles and some I created specifically for this printer. I always suggest that people look at prints of known test images, since they are (mostly) devoid of the subtle tricks that our memory plays on us when looking at a personal photo, particularly one that you’ve spent any time editing and working on. The images (and many others) are available for free download on this site. 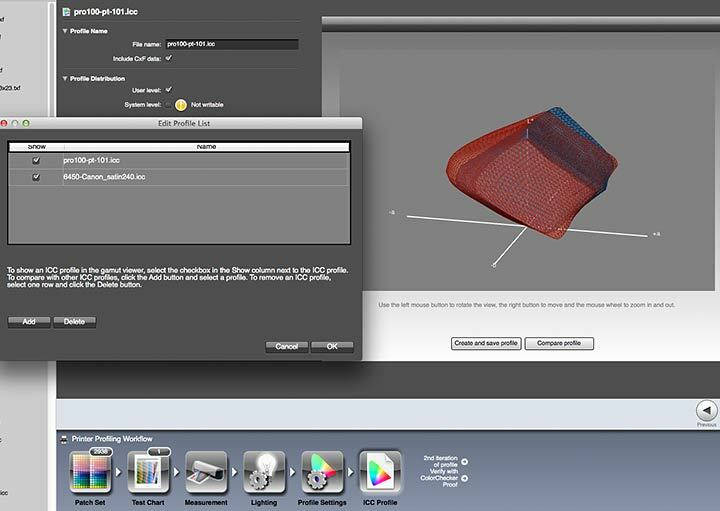 Both images have lots of components to specifically test different aspects of printer performance. As long as I selected correct paper types and sizes, everything worked just fine. I mention this, since with any display, error messages are seen on the computer driving the printer, rather than the printer. Fine if it’s a few feet away, less so if it’s in another room. A lack of display is an obvious design choice (and cost saving) but I’m afraid that I prefer some form of display (even a fairly basic one such as on my Canon iPF8300). 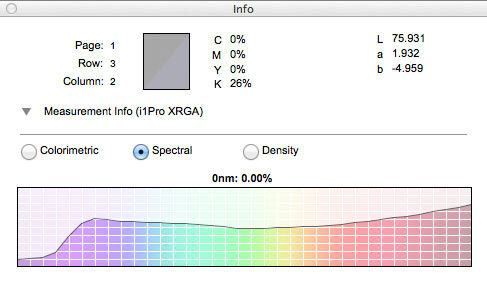 I like to make our own colour profiles for papers and printers I’m testing, using i1Profiler from X-rite and an i1iSis XLscanning spectrophotometer. These colour targets give a very good feel for how a paper and ink work together. This being a dye based ink, showed almost none of the gloss differential you sometimes can see with Pigment inks. 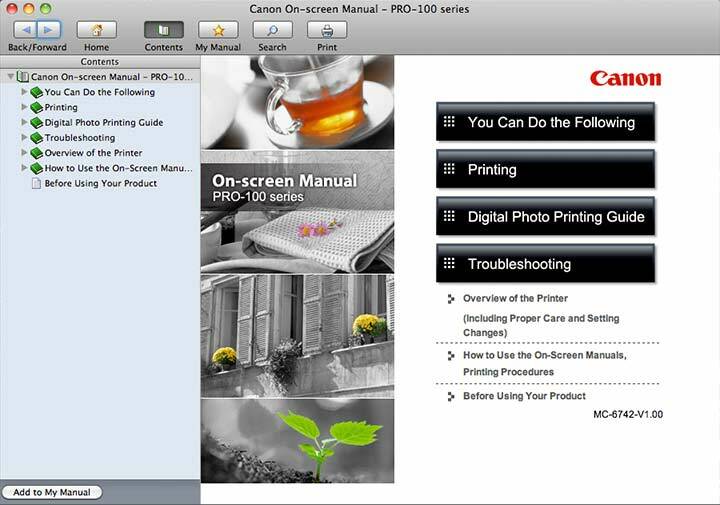 Canon include a profiling tool which can work with your own spectrophotometer – this is detailed in the PRO-10 review, along with more details on the Canon supplied software. 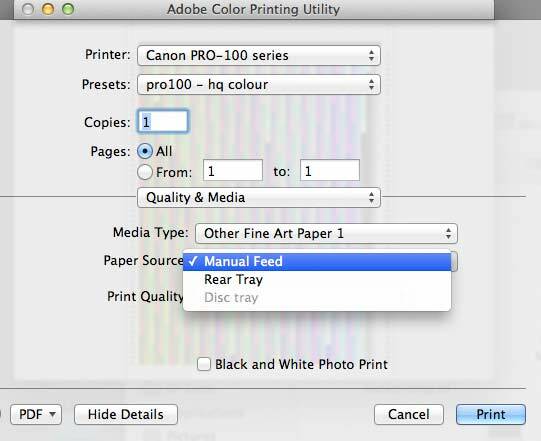 I’m printing targets (as TIFF files) using the (free) Adobe Colour Printing Utility. 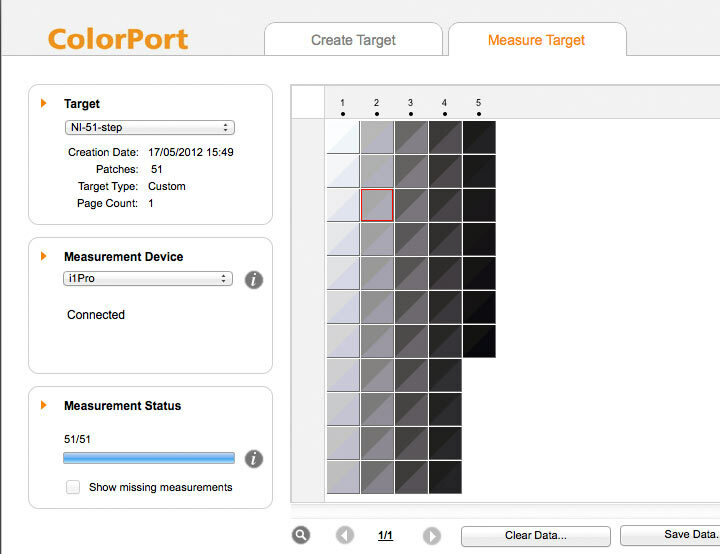 This ensures that your targets are printed without any form of colour management. I don’t normally show gamut models of profiles, but this one illustrates the fundamental difference between these dye based inks and pigments. The blue (dye) shape is bigger in yellows and some other bright colours. 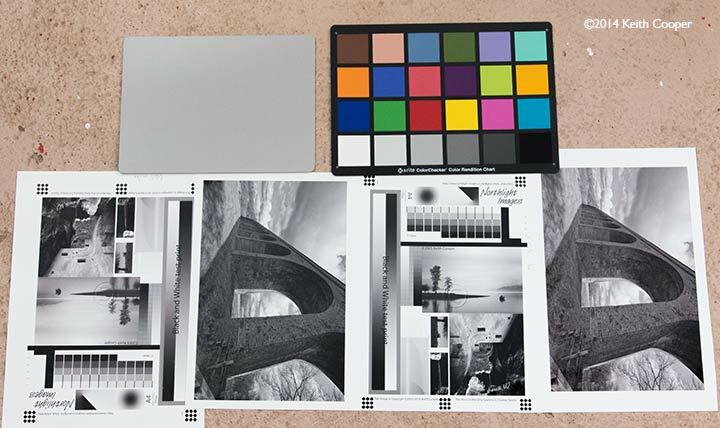 The pigment ink gamut is larger (the 6450 is a 12 ink printer after all), but mainly in darker colours. A brief comparison with some old glossy prints from when I tested the PRO-10, suggests that the PRO-100 is indeed marginally better in producing bright glossy prints, but that the pigment inks look better on some more heavily textured papers. The differences are slight, and testing was seriously curtailed by the faulty printer. One of the key features of the printer is the multiple grey inks. This helps colour rendition too, by allowing for very strong colour inks that can be diluted with greys for less saturated colours. The real interest for me though was how this printer would perform for monochrome printing. 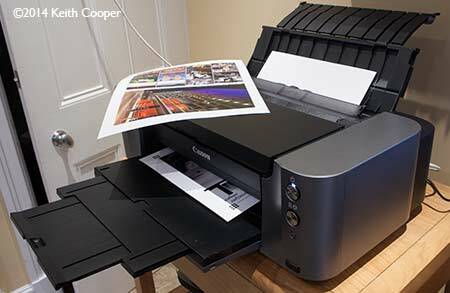 The Canon print driver offers a specialist monochrome print mode, that in our large iPF8300 and the PRO-1 give very high quality prints. 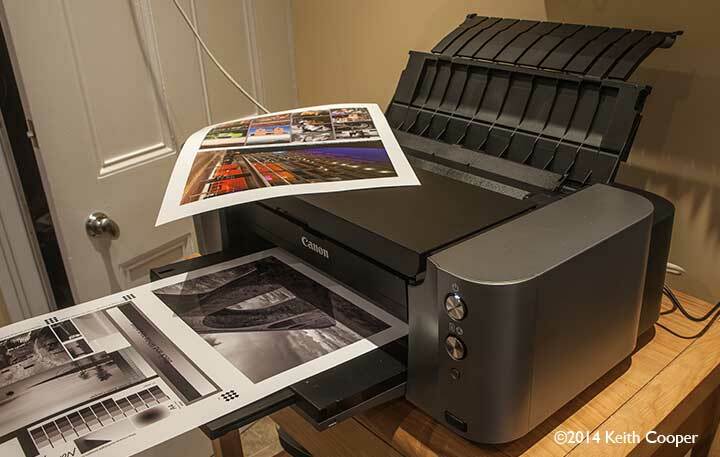 The PRO-100 has multiple grey inks and a B&W print mode. My B&W test image includes a 51 step wedge that you can directly read with a spectrophotometer. The Canon PT-101 glossy paper obviously has some optical brighteners (OBAs) which show up in the scan results as those slightly blueish areas. 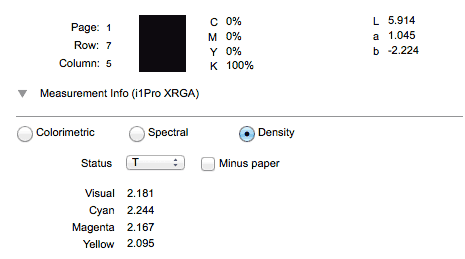 At K=100% (full black), we see a Dmax of nearly 2.2, so a good solid black. Feeding the results into QTR, shows a bit of crunching of the shadows in the default B&W setting. 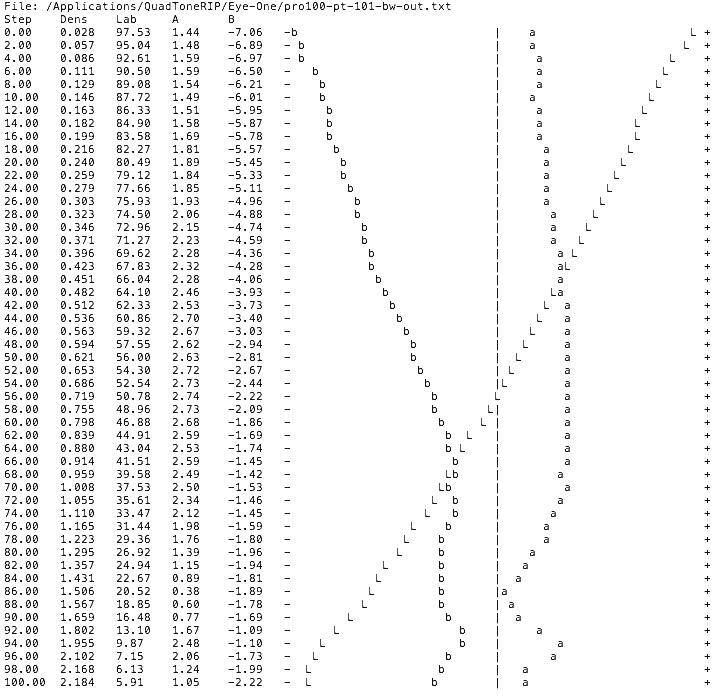 This curve is from making a QTR linearising profile for this paper. The ‘a’ and ‘b’ curves wandering all over the place also suggests to me that we’re not looking at an ideal paper for monochrome prints. I’ve written up several articles concerned with fine tuning B&W responses of printers to get more consistent results and I have no doubt that the PRO-100, with some work, could produce some excellent prints. Out of the box though, it falls down a bit in this area. I suspect that were I able to use some decent OBA free fine art papers my impression might be better, but I can’t be sure. These two example shots have been white balanced under halogen lighting and daylight. 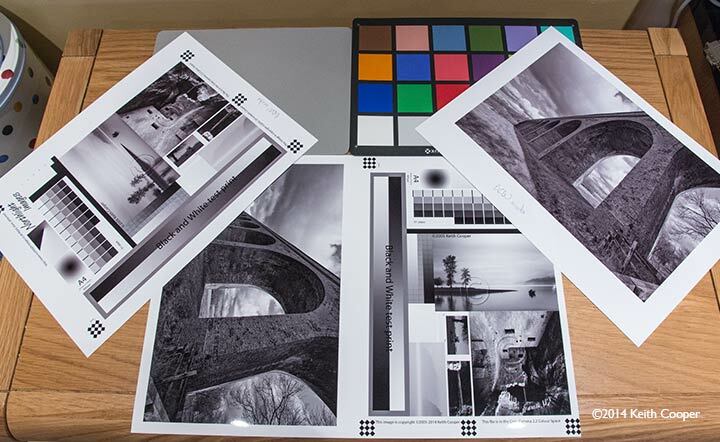 In both examples, the middle pair of images are printed using a high quality colour ICC profile, whilst the outer ones are uncorrected prints, using just the B&W print mode. The paper is Canon Pro Platinum PT-101. I don’t know about you, but my prints are far more likely to be seen under artificial lighting. 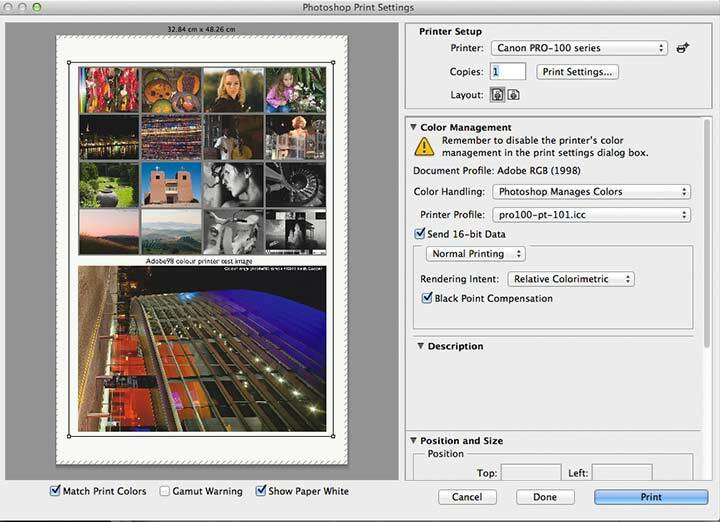 The Print Studio Pro plugin offers a ‘pattern print’ option, which prints lots of different versions of an image, with minor changes in settings. This is one way to fine tune B&W output for example. I’d reiterate that there are many ways of ‘tuning’ B&W output for the paper you’re using, but you will need to put some work in (and paper/ink) to get the best out of this printer. We make a specific point of not selling hardware, but if you found the review of help please consider buying the PR-100, or any other items at all, via our link with Amazon. 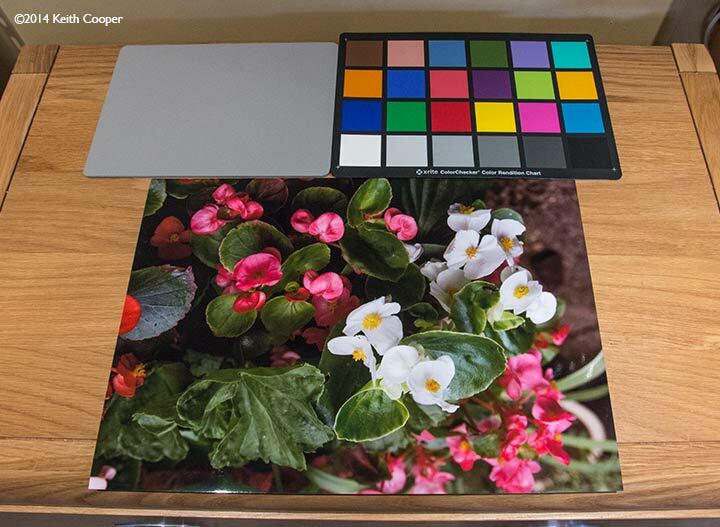 Print quality on glossy surface papers for colour images is excellent. If you’re looking for a printer for your family photos then the PRO-100 is fast and effective. Prints have a very good surface finish and with borderless printing can look like you had them produced at a photo lab. Black and white printing, with the extra grey inks, surprised me in that it needed more fine tuning and adjustment than I’d expected, given the many other Canon printers I’ve tested (and own). The elephant in the room, is printing on higher quality art papers, since most need to go through the broken rear feed. I do feel I should mention this again since it’s meant that a vital part of my testing is missing. Ink usage during testing didn’t seem excessive, with grey and light magenta both going down a bit faster. The printer has what I would consider seriously limited maximum page lengths. So, don’t think you are going to be able to use roll paper for big panoramic images. Size selection in the printer driver is not immediately clear, although it is explained in the manual. If you’re unsure about all the options and required settings then this is one time you really should give the manual a look. The lack of display on the printer does mean that it’s possible to stand in front of the printer, with a flashing light, but nothing happening, other than an error message on a computer in another room. Good old ‘Support Code : 88’ … really? Large margins for some paper types are an annoyance, or at other times a waste of good paper and ink, such as the image below where the bottom of my profiling target has been lost in a huge margin. A3+ profiling sheets use up quite a bit of ink, and will soon cause noticeable drops in levels. To their credit, Canon publish ink usage figures. 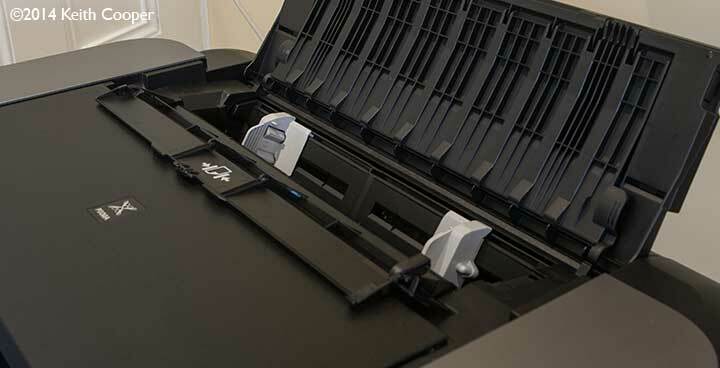 The printer is very solidly built and a good clean design. Excellent for glossy photo prints, although margin sizes may be an issue on higher quality art papers. Needs careful choice of paper for best results – if you are going to use 3rd party photo papers, then note that some just don’t take dye inks very well. 8 ink (Dye based) A3+ printer. 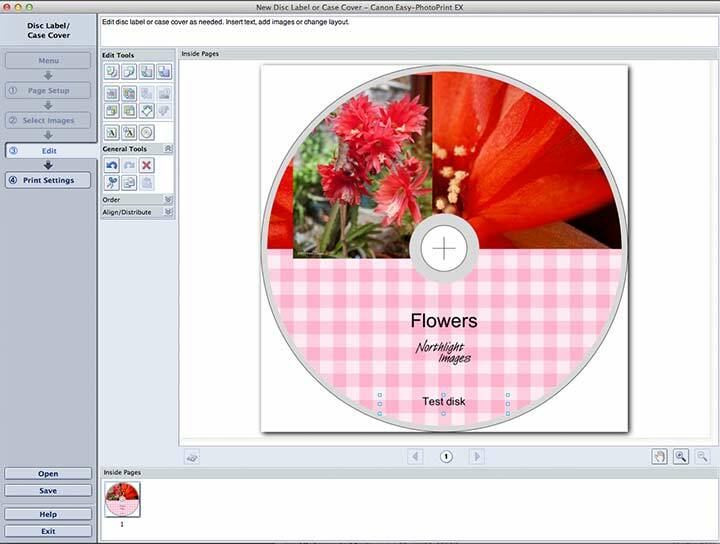 CD printing option. USB, Ethernet and wireless connectivity. 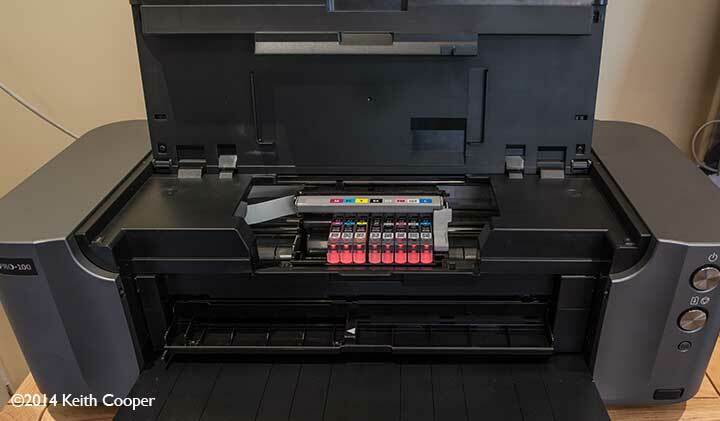 Print Engine Inkjet, 8 Single Inks, ChromaLife100+ ink system with 3pl droplet size & FINE print head. 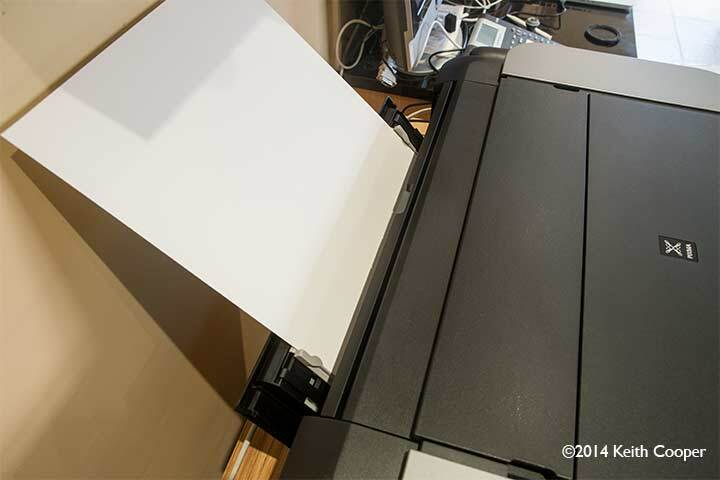 Print Resolution ¹ Ink droplets can be placed with a minimum pitch of 1/4800 inch. Photo Lab Quality Speed ¹ 11″X14″ image printed with borders onto A3+ paper using default settings. Ink Tanks Life ¹ Declared yield value in accordance with ISO/IEC 29102. Values obtained by continuous printing. ² When printing ISO/JIS-SCID N2 pattern at 11″x14″ size continuously on A3+ photo paper Pro Platinum (PT-101), with the default settings using Windows 7 printer driver and Photoshop CS4. 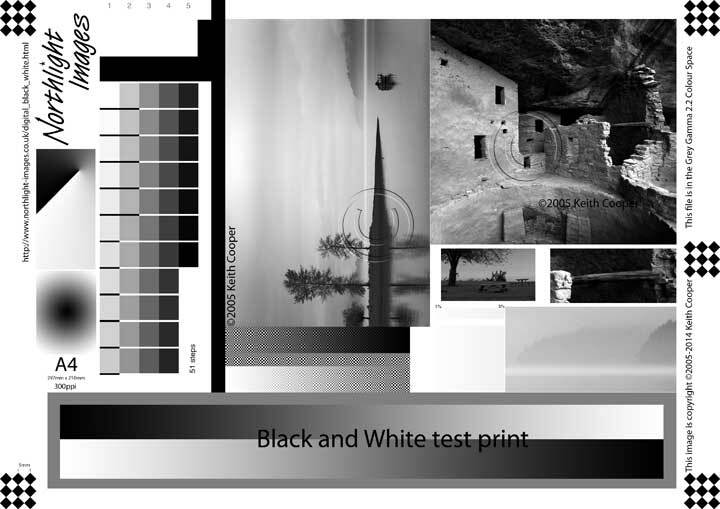 Borderless Printing ¹ When printing on Fine Art Paper top and bottom margins are minimum 30mm. Interface Type – Mobile Phone / PDA ¹ Requires connection over Wi-Fi network and installation of free Canon application: EPP for Android and iEPP for iOS. Not available in certain countries or regions. Driver Features ¹ Some features available in Windows driver only. Software Included ¹ PrintStudioPro is a printing software plug-in for the Canon Digital Photo Professional (3.12 or later), Adobe Photoshop (CS4 or later), Adobe Photoshop Elements (8 or later), Adobe Photoshop Lightroom (2.7 or later). 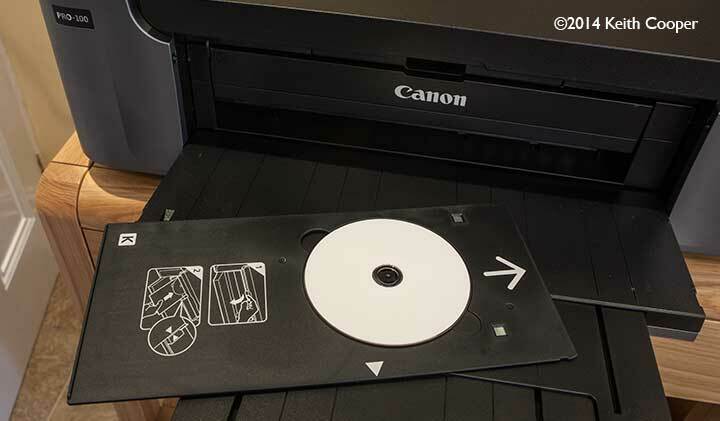 ² Full HD Movie Print is available for MOV and MP4 movie files created by Canon digital and video cameras. Requires installation of software bundled with Canon video or digital camera, from which the movie was captured. MOV files require: ZoomBrowser EX / ImageBrowser (version 6.5 or later), MP4 files require: ImageBrowser EX (version 1.0 or later). ³ Easy-WebPrint EX requires Internet Explorer 7 or later. Power Consumption ¹ When printing ISO/JIS-SCID N2 pattern on A4 size plain paper using default settings. Acoustic Noise Levels ¹ When printing ISO/JIS-SCID N2 pattern on 10x15cm Photo Paper Plus Glossy II using default settings.